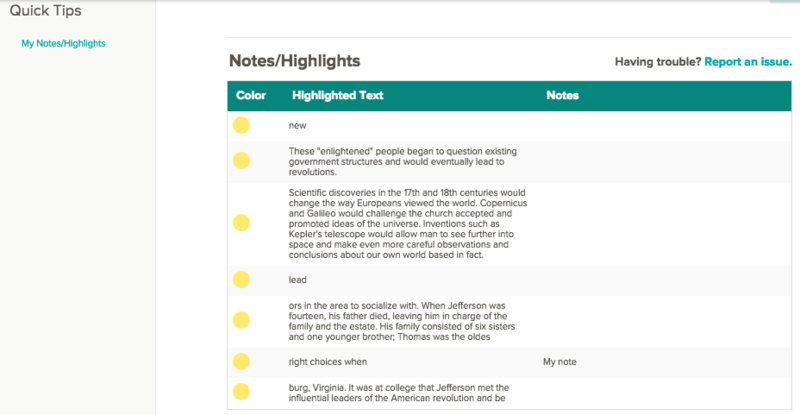 You can highlight text and make notes in any section of a FlexBook® textbook or read modality. Go to a section of a FlexBook® textbook or a read modality. Click the highlighter tool in the top right of the section. 4. Select the text you want to highlight. Click on the highlighted section. Select a new color from the menu that appears. Go to a section of a FlexBook® textbook or read modality. Click on the note tool in the top right of the section. Select the text you want to annotate. Write in the text field that appears. Click the "save" to save or "cancel" to close the popup and discard the note. Click on the note icon ...to edit the note or remove the text to delete the note. You highlights and notes will appear in the Notes/Highlights section at the bottom of the page. All of your highlights and notes are only visible to you. To make your annotations more accessible, select "Add to Library" so that you can always find your highlights and notes in Library.